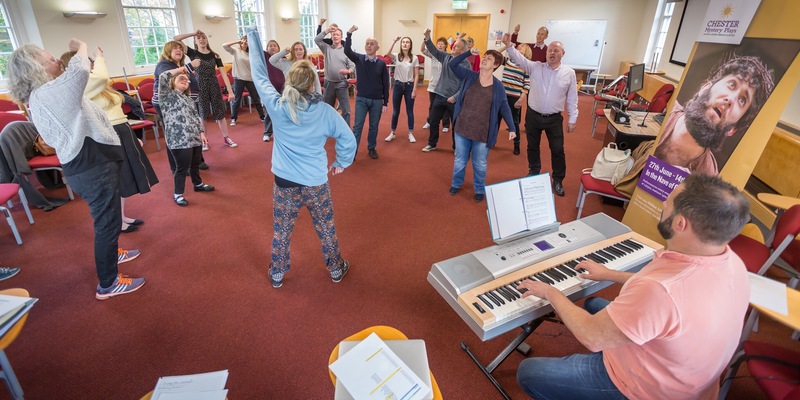 In the first of a series of blog posts, We Are Chester editor Angela Ferguson shares her experience of getting involved with the Chester Mystery Plays for the first time. In this first instalment, find out how she got on when she stepped way out of her comfort zone to audition for a part in this five yearly historic event. Main photo: Mark Carline. Can I share a secret with you? Divorce has been the making of me. Now there’s a bold statement. Let me explain. Since I became a single mum to three wonderful children six years ago I’ve branched out in ways I never imagined, including my latest adventure involving the wonderful Chester Mystery Plays. More of that later. First, a bit of background about me. Divorce has been, in many respects, a blessing. Now, don’t get me wrong, when I first came home to an empty house after splitting from my then husband, I wept as the realisation of what my dramatic change of circumstances truly meant began to sink in. I was scared and suddenly felt very alone, even when amongst a group of friends. The world seemed a terrifying place and I could not, for one moment, imagine how I would pick up the pieces. How could I stay strong and resilient for myself and my children? And if you’d told me back then that I would still be a single mum six years on then I have no doubt that I’d have curled up in a ball and refused to come out into the big wide world, feeling utterly bereft and sorry for myself. Yet here I am – still a single mum of three – still juggling family life and work but making darn sure that the kids aren’t the only ones doing fun activities. Yes, I’ve been doing some fun stuff too and it has made a big difference in terms of bolstering my confidence. And I decided it was about time that I shared my perhaps unusual take on the impact of divorce. What the heck, hey. If one person reading this realises that they’re not alone in feeling overwhelmed by the aftermath of divorce, separation and single parenthood and that there is light at the end of the tunnel, then I’ll be a very happy woman. I wanted to use this blog post to say that, six years on, and with the marvellous thing that is hindsight, I can honestly say that I have found strength and I have done things that I’m not sure I would have done had I remained in what was an unhappy marriage. I’m still here and I’m far from perfect. Some days and weeks I just about muddle through and I can’t pretend that it isn’t tough balancing the budget at times. I also suffer from occasional bouts of depression and anxiety and that stinks. I wish I didn’t but I do and at least I now know the warning signs and when to ask for help. I also have the most amazing support network of family and friends around me to spur me on and support me. And, do you know what, I’ve discovered that there’s something about facing a scary situation that brings out the daredevil in me. And I think this daredevil may get bigger and bolder as I get older. So, what has divorce done for me? Well, I decided to dip my toes back into the water of writing again after a lengthy break, and looked for outlets where I could submit work. Nothing quite materialised, so I decided to set up my own website – or webzine – as I like to call it, looking at all things arts and cultural in and around Chester. That website is the one you are looking at right at this very moment. Step by step, I built this up, with a small but growing band of fantastic and talented volunteers. These lovely people are equally as passionate as I am when it comes to shouting about the good stuff happening in and around Chester. I couldn’t do this without them. They are absolute stars. And I also found myself working pretty much full-time as a university journalism lecturer, getting to work with and support an amazing bunch of students of all ages and backgrounds. They are a daily inspiration to me, spurring me on and encouraging me to be the best lecturer I can be. I feel honoured and humbled to be in such a position of responsibility, playing a part in their lives and future endeavours. I think the lecturing and my students also inspired me to venture into the rather wonderful world of community radio, co-hosting a monthly We Are Chester show on Flipside Radio in Chester. It is a thrill to go ‘on air’ with my lovely co-hosts Tori Erskine and James Wright as we have the privilege of interviewing a wide range of fascinating people. And so, this brings me to my latest adventure, involving the much respected Chester Mystery Plays (CMP), which involve a community cast of actors, singers and musicians staging well known stories from the Bible every five years. The Plays, last staged in 2013, will be put on in the stunning surroundings of Chester Cathedral. CMP chair Jo Sykes was a guest on the We Are Chester show and she must have been incredibly persuasive when she spoke about the Plays because I signed up for the auditions, having initially dismissed the idea as a silly one as far as my acting talents were concerned. And I auditioned despite the thought of doing so being so far out of my comfort zone I’d have needed a rocket ship to get back there afterwards. And so it was that on a gloriously sunny Sunday morning I found myself surrounded by some of the most lovely and friendly people I have ever met, at the Chester Mystery Plays auditions, held at the University of Chester’s Queens Park campus. Now I was given the choice of reading the part of Mary or God as my audition piece. Bearing in mind that my last acting role was at school, to say my acting skills are rudimentary (for that read non-existent) would be a gargantuan understatement. But, in keeping with my devilish stance on life (yes, I see the irony there), I opted to go for it and read the latter role. It somehow seemed fitting for what was a wholly surreal experience. And I even took part in a workshop where I – gulp – had to sing and bust some moves on the floor of a University of Chester lecture room. And all of this accompanied by an enthusiastic and amazingly talented group of fellow audition attendees, all joining in with a jolly folk ditty which involved singing about drinking. Once again, my nerves began to subside as the buzz of singing in a group kicked in. It was food for the soul. And I was hooked. The feelgood factor was absolutely immense and I was buzzing afterwards. I’m now hugely excited at the thought of rehearsals beginning in the new year. I’ll be ever so chuffed to be part of this historic and magical spectacle, which is to be staged at Chester Cathedral next June and July. After all, it’s not every day that you get to work with such incredible talent as actor and award-winning playwright Deborah McAndrew, musical director Matt Baker, artistic director Peter Leslie Wild, actor and choreographer Cariad Morgan and Jo Sykes herself. And I get the chance to meet a whole load of supportive and talented genuinely lovely folk into the bargain. And so it is that I can say, with absolute conviction and, yes, the benefit of hindsight, that divorce truly has been the making of me. I have also come firmly to the conclusion that the arts should always be a big part of my life. It’s my therapy, if you like. I love it and I believe it makes me a much happier person, which is surely a good thing for all who know me, not least of which my children and loved ones. So watch this space to find out how I get on as rehearsals begin in the new year. A part of me still thinks the idea of me doing any sort of acting is ridiculous, but, do you know what, life’s far too short to pass up an opportunity to try something new and to push yourself out of the old comfort zone. So here I am and please check back in for more instalments as I prepare to leave my comfort zone well and truly behind and venture into the uncharted waters that are the Chester Mystery Plays zone. Thanks for taking the time to read this and please do get in touch to let me know your thoughts. Chester Mystery Plays were written by Benedictine Monks and performed by the people of Chester back in the 14th and 15th century. They were an annual tradition, until they were banned during the Reformation, when Protestant Queen Elizabeth I came to the throne. They weren’t reintroduced to Chester’s ancient streets until 1951, the year of the Festival of Britain. Chester Mystery Plays will be staged at Chester Cathedral from 27 June to 14 July 2018. Tickets are now available here.